Before the start of the season Josh Cain Jr. and Devin Hurst were named to the players to watch list. This is a list put out by Kentucky High School Baseball Coaches Association each year before the season starts. 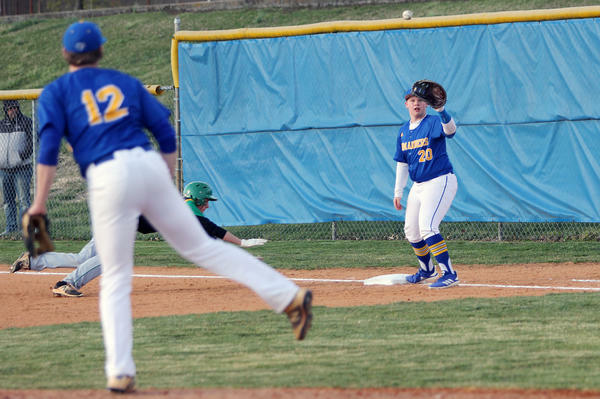 On March 18 WC played in their first game of the regular season matching up against Green County. The Commanders started off with senior right hander Josh Cain on the mound. Green County started off with senior Brody Bush. Cain’s first batter hit a fly ball to center field that was caught by Josh Burkhead. Cain would then give up two singles to put runners on first and second. The next batter hit a grounder to second baseman Tavin Hodgens who was only able to get the out at second. An error during the next at bat scored the runner from third giving Green County the early 1-0 lead. Cain would get WC out of the top half of the inning when Bush hit a ground ball to Hodgens for the easy out at second. Jatavian Churchill led off for the Commanders hitting a single to right field to get the team going. 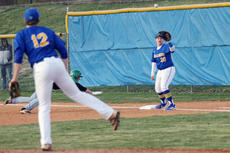 Hodgens would then lay down a bunt and he would also reach base giving him a bunt single and moving Churchill to second. Cain would then be up and would take a walk loading the bases for the Commanders. Bush then got into his comfort zone and would strike out the next three batters he faced. WC would strand 3 on the base paths and head into the second. The second inning belonged to the pitchers as Cain struck out 2 and get a groundout for a three up three down start to the inning. Bush had the same thing in mind when he struck out the side for WC making it a quick second inning. Cain started the third with a quick fly out and line out to Burkhead in centerfield before Kellen Whitlow from GC decided to make things interesting with a two out double. Cain then got a big pop up and Churchill would easily get the third out. WC was back at the top of the line up for WC as Churchill led us off again but this time he would be struck out at the plate. Hodgens got a base hit putting him on base for the second time this game. Cain saw another walk and Hodgens advanced to second base. The next two batters struck out, and hit a fly out to center field to end the inning for WC stranding two more runners on base. Cain got a quick ground out, followed by a strike out to get a quick start to the fourth inning. A pop up in the infield right on the pitcher’s mound gave WC some trouble as no one would be able to it giving Jacob Scott from GC a single, but he would be thrown out trying to make it a double. Grant Satterly and Will Pettus would both end up with singles in the fourth, but three more strikeouts for Bush would prove to be to much as WC would strand 2 more and head into the fifth. The last three innings gave the Commanders some trouble as they surrendered eight runs. A sacrifice bunt and a wild pitch put a runner on third with one out. A ground ball to Taylor Smith at third allowed another runner as Smith’s throw would be high and Grant Hilton had to jump to make the catch but pulled him off the bag. A sacrifice fly to the outfield scored the second run of the game giving GC the 2-0 lead. A wild pitch got by the catcher Oscar Saucedo a good throw almost got the runner but would just be late and GC would take the 3-0 lead. Cain got a pop up to Hodgens at second base to end the inning. Green County changed pitchers in the bottom of the fifth sending Cole Edmonds to the mound. Bush would end the day giving up two walks, four hits, and striking out 11 through 4 innings. Hodgens got ahold of a shot and send it deep to right field but the right field for GC would be able to make the catch. Cain got his third walk of the game before being hit into a fielders choice. Another fielders choice ended the inning WC down 3 to 0. Cain gave up two singles to start the sixth the second being a hit and run play so with no outs there would be runners on the corners. A wild pitch got by Saucedo to score GC fourth run of the game. Blair then changed pitchers as Satterly came in from the outfield to pitch. He entered on a 3-2 count and walk the first batter he saw only throwing one pitch. Another sacrifice fly ball to the outfield scored another for GC giving them the 5-0 lead. A strikeout and a ball hit back to Satterly ended the inning on an easy out at first. Cain worked five and a third innings giving up a walk, 7 hits, and getting 3 strikeouts. Edmonds only survived an inning as he hit Hilton, and walk Satterly to lead off the bottom of the sixth. Casen Murray took the ball with 2 on and no outs and would get a fielders choice and 2 quick strikeouts to end the sixth inning for WC. Edmonds worked a inning and gave up 2 walks. A double by Jackson Johnson led things off for GC. A smart step off the mound by Satterly caught Johnson in a rundown for a quick out number one. After giving up a walk and a single an error sent another run in to score giving GC the 6 to 0 lead. A single by Brice Blakeman brought in another run, followed by a wild pitch and a sacrifice fly to give the Dragons the 9 to 0 lead heading into the bottom of the seventh. WC was unable to do anything with the bats was a quick three up three down bottom of the seventh ended the game. WC gave up 10 hits on 9 runs and have 4 errors on the night. They would also leave 10 men on base. GC would give up 5 hits, on no runs, no errors, and leave 5 men on base. Blair know that this wasn’t the best showing of his players but know’s they have the talent to win ball games.